Originally posted on the Ms. Blog. Mother’s Day has arrived. This Sunday, tradition dictates that we will celebrate our moms by showering them with flowers or brunches or candy and finding a way to say “I love you.” For many, this may feel sufficient, but for more and more people, it’s not enough. I, for one, have always struggled to celebrate my mom on this day. The greeting card aisles overwhelm me, and I can never seem to find a card that resonates with me or my family. As I’ve grown older, I find that my friends, my peers and my co-workers have felt a similar anxiety. We’re not being depicted in the mainstream media and it makes it difficult to celebrate our moms in the ways that we want. I love my mom more than words could say, and I often think about the choices and sacrifices she must have made to raise me, her only child. When my parents left their home in India for San Francisco in the ’70s, my father was eager to make the move. My mother, not so much. She left her sister and her parents back home. Sometimes, when she talks about them, I hear something in her voice–a tone of mourning even after all these years. What it must have taken for her to build a new life and raise a child in a place that didn’t yet feel like home, I’ll never know. Over the years, I’ve collected stories of motherhood and stored them away in my heart to recall when I consider parenthood: stories of women raising their children by themselves, of women who were not yet ready to become caregivers, of women who found each other and of the ways their love and their family have been made invisible by society. These are stories of struggle, but also of strength. I see that strength reflected in these women’s children. It’s pretty powerful. Yet every year I fail to find the right images and the right words to support these moms. Moms are so varied but we still see only one kind of mother portrayed each year. The commercialization of motherhood not so subliminally shames moms on the periphery by not acknowledging their existence on the one day devoted to celebrating moms. So we decided to do something about it. We launched a “Mama’s Day Our Way” campaign, featuring beautiful e-cards that capture the varied aspects of mamahood–immigration, separation, disability and queerness–and the love, joy and appreciation we feel for our mamas. There are even cards to appreciate the people who helped birth and care for our children. We’re in the throes of the War on Women, battling with government agencies for our right to make decisions about our bodies, to have the resources and support we need to uplift our families and to thrive in our communities, without a constant threat to our freedom. 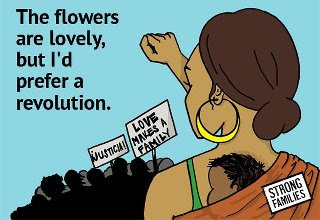 How can we properly honor our mamas who combat poverty, whose partnerships are denied, who are separated from their children, who are dehumanized in prisons? How do we uplift single mamas and queer mamas and young mamas, and tell them that we support them and stand with them? On Mother’s Day as on all days, the personal is political. We hope you’ll browse our cards, customize a message and send them to the mamas in your life. You can read testimonies of strength and courage in parenting on our Strong Families blog. And you can take action to ensure that all mamas have the support they need to be strong and the rights they need to be properly recognized. Nina Jacinto is the Development Manager at Forward Together.